Wednesday, 27 April, 2011. 21:55. 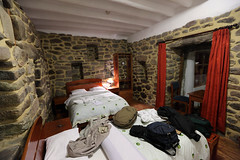 Tika Wasi Valley Hotel, Ollantaytambo. It’s been another full day. it started at 08:00 as we rose for breakfast. M. had slept well, but I don’t think I got any real sleep at all again. I laid in bed all night thinking “fall asleep” and being unable to do so. I had some sort of half-awake dreams about Ale leading us to all sorts of weird places. It was probably my brain trying to sort out the events of the last few days and doing it despite me not yet being asleep. Breakfast was as yesterday, except they replaced the watermelon with kiwifruit. After this, at 09:30, we assembled with the group for the day’s activities. These began with a bus ride uphill from Cusco and over a pass into the next valley, where we stopped at the town of Pisaq. The scenery along the way was spectacular, and Ale stopped the bus a couple of times to let us stretch our legs and take photos of the Andean scenery. In Pisaq we stopped at a bakery, apparently run out the back of some guy’s home. He made traditional empanadas in a small wood-fired oven. There were four choices: traditional (spicy cheese, tomato, onion, and herbs), ham and cheese, cheese and basil, and sweet (banana, cinnamon, clove, nutmeg). I had a traditional and M. had a cheese and basil, which turned out to also have tomato in it. They were 2 soles each, and smallish and flat, not like empanadas I’ve seen elsewhere that are more stuffed and rounded. The flour was quinoa. They were okay, but nothing special. While eating empanadas and using the loos at this place, Zeeshan took a turn for the worse, having difficulty breathing in the thin air at this altitude. Ale arranged a taxi to take her and Zaina back to Cusco to see the doctor there. This took some time to organise, so a few of us returned to the shade of the bakery and I bought a sweet empanada to try as well. It was again decent, but nothing amazing. With Zeeshan on her way back to Cusco with Zaina to look after her, the rest of us boarded the bus again for a trip further uphill to the small native weaving community of Chawaytiri. The road began as paved, but we soon turned off it on to a marrow, dusty dirt road. This wound its way up the valley, cut into the mountainside so that for the most part on our left was a wall of dirt, while on our right was a sheer drop, up to 200 or 300 metres to a stream far below. There was plenty of evidence of rockfalls and mudslides, and the road reminded us of the Bolivian Death Road we’d seen on Top Gear. Well, it was Peru, but it was still an Andean death road. The view from the road was, however, amazing, with tall mountains and deep valleys everywhere. We arrived at the weaving community around 12:00. Ale drilled us in our Quechua greetings since most of the natives spoke no Spanish, let alone English. We piled out of the bus to enter the working yard where about 30 people, men and women, all dressed in their traditional colourful working costumes, greeted us warmly, one by one, shaking our hands. Ale had said the costumes are not put on for tourists. 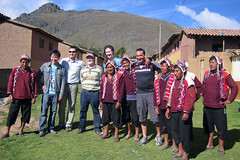 Intrepid is the only tour company that visits this community, and only brings groups three or four times a month. The costumes are what they wear every day. The weavers were dark skinned, with the mean having prominent hawk-like noses, and the women round, flattish faces. Their hands were smooth and soft, but also tough and leathery. The first thing was that we assembled in a circle with us sitting on benches and the weavers sitting either on the grass or on short working stools. Ale interpreted as they introduced themselves by name, also stating their marital status and how many children they had. Some of them, both men and women, were unmarried, but had children anyway. Ale explained that they had a “trial period” system where a man and woman would live together for a while to see if they got along. If so, they got married, if not, they went their separate ways. It was okay to have children during this trial period. 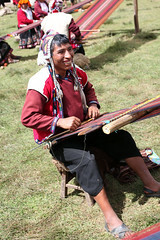 We also learnt their ages ranged from about 25 to 30s, with only one noticeably older woman among the weavers. She was wearing a black hat fringed with green material, unlike all the other women, whose hats were the same but with an orange fringe. Ale explained the green fringe indicated she was a widow. Next we introduced ourselves, saying our names, whether we were married, and where we came from. The weavers interrupted frequently with questions. Ale had warned us that their questions might be considered “indiscreet” by western standards – of a personal nature. But they weren’t too bad, and everyone had laughs when amusing things came out, or they made comments that Ale interpreted and turned out to be funny. One lady had hair extensions to make her plaits long and attractive. One man was sitting away from the group because, as Ale explained, he had an “embarrassing secret”, which she didn’t probe into. The men were all on stools and the women on the grass. They sat segregated, women on our left, men on our right. Except for one young man who Ale described as “going with modern times”, who sat amidst the women. Andrew introduced himself as “the best soccer player in Australia”, which caused genuine looking looks and comments of concern from them, as Ale had explained to us earlier that after lunch we would play a game of soccer with them. Gary caused a stir when he said he and Lyn had fourteen children. This caused the men in the group to look at him in awe and comment that he must be a great man then, which caused us all to crack up laughing. Ale translated and explained that they were sceptical about the fourteen children, and they kept asking probing questions about it, asking Lyn and Gary’s ages, and how old all their kids were. It was a great session of interaction with lots of laughs on both sides. After this, the community served us lunch, beginning with a quinoa soup with bits of potato and carrot in it. Next came a deep fried cuy, one to share between all of us, and already dismembered into several pieces, plus plates of rice, a mix of beans and some other vegetables, an a yellow shredded vegetable that Ale said was “a type of potato, mixed with potato”. The soup was okay, but the cuy and the vegetables were very good, especially the type of potato mixed with potato. The cuy had darker and tastier meat than the one we’d had yesterday. The others said it had a more herby taste, but I couldn’t really tell that. We also got cups of Andean mint tea, which was very good. After the meal, most of the weavers laid out bundles of their wares on the grass for us to peruse and buy if we felt so inclined. They were keen to show off and sell their products, and it was hard to walk past each one without being able to say anything in their language. Everyone bought something, M. getting a scarf for 200 soles, bargained down from 250, and me buying a woollen belt from 15 soles (down from 20). 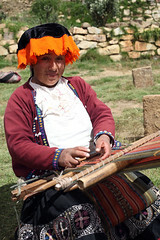 Following the buying, we had the anticipated soccer game against a team made up of six male weavers. Our team was Andrew, me, Gary, Jian, Laura, and another of the weavers to make up the numbers. The field was a patch of rough, sloping grass between two rows of adobe brick buildings. It sloped up slightly towards one goal, and we demanded to run downhill because of our altitude disadvantage. 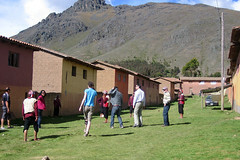 The village was the highest place we will go on our entire trip, at 3900 metres elevation. Before starting, Andrew ran to the bus to change into a soccer shirt to maintain the illusion of his abilities. The game was a hectic, scrambling affair, with local rules allowing the ball to bounce off the buildings. Goals had to pass through the stone block markers along the ground to count. Andrew managed to score an early goal to put at 1-0 up. The weavers came back, however, scoring one themselves, followed by another, which was controversial as it passed over a stone goal marker. The game was extremely exhausting in the thin air, and Ale enforced a strict 15-minute time limit to prevent any of us getting too out of breath. Nevertheless, I found myself frequently reduced to standing and panting to regain my breath, helpless to do anything else. Laura managed a brilliant header which made the onlooking weavers ooh and ah in appreciation. In the end we claimed a respectable 1-1 draw, but the weavers claimed they had won 2-1. Ale said in all the time she’d been bringing tour groups here, the weavers had lost only once, so we were pretty happy with the draw. The deal was that if we won we would be given woven bracelets, while if the weavers won we would buy them bottles of soft drink. Given the disagreement over the final result, we bought them one large bottle to share, which seemed to do the trick. The soccer game done, two of the weavers led us a short walk up a hill to a cuy farm. This turned out to be a small building of mud brick, inside which were a dozen or so pens about a metre square. 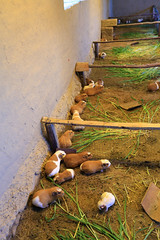 In each pen were about a dozen guinea pigs of various sizes, including some babies only ten days old (as we were told). They nibbled on grass, unaware of their eventual fates. The farmer showed off the stud male cuy, used to breed high quality babies. This done, we piled back on the bus for the trip back down the death road to Pisaq. There, we stopped at the bakery again for a toilet stop. Ale called the doctor in Cusco and got news that Zaina and Zeeshan would be rejoining us tonight at Ollantaytambo, which everyone was happy to hear. She arranged transport for them and said we’d meet up at our hotel for the night. 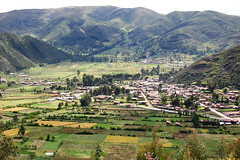 The bus drove us down the Sacred Valley of the Incas, alongside the Urabamba River, through a series of small towns. 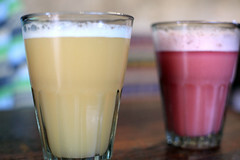 In the town of Urabamba we stopped at a place where a woman made chicha, the traditional corn beer of the region. The woman invited us into her workshop, where Ale explained the process. Starting with germinated white or yellow corn kernels, these are boiled for a couple of hours, them strained in a straw basket to extract the juice. This was then placed in a large earthenware pot to ferment overnight, and it was done! The woman made two versions: the traditional version with no other ingredients, which was a pale yellow colour, and one with strawberry and some sugar added, which was pink. She poured samples of each into large glasses – very large glasses which must have held a bit over a litre each. Ale said these were the regular serving size! At 4% alcohol, the locals needed to drink five or more of these glasses to get drunk. The woman handed out small plastic cups which she partly filled with samples for us to taste. The yellow one smelled faintly beer-like and tasted rather bitter, with a slight tingle of fermentation bubbles. The strawberry one tasted much nicer, slightly sweet and fruity. We took more samples to sip as Ale explained the various traditions around chicha, such as the pouring of the first drops on to the ground for Mother Earth. While sitting in the workroom, some local customers appeared in the serving area outside. They got the big glasses, including a young girl, maybe only ten years old. We expressed amazement when she drank from a large glass of her own. Ale explained that it was normal for children that age to drink chicha, but they wouldn’t drink the five glasses necessary to get drunk. Following the chicha, we moved out to the serving area to try our hand at sapo, a game involving tossing bronze discs on to a small table with various holes and spinning devices on it to try to score points. In the centre of the table was a brass frog with an open mouth. Opening a drawer in the table revealed compartments where the discs fell into, with point values marked. These ranged from 500 to the maximum of 5000 for getting a disc into the frog’s mouth. Ale explained “sapo” is the Quechua word for frog. We all had goes, throwing twelve discs at the table. The highest score achieved was Andrew with 4500. Then we coaxed the ten-year-old girl to play, after she’d finished her enormous glass of chicha. She scored 7500 on her first go! We all had a few more goes, but nobody could beat her score, until I managed a 10,500. 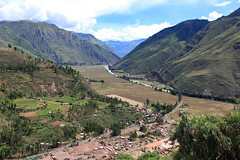 Our pride restored, we headed back to the bus for the remainder of the trip to Ollantaytambo. We arrived in the town shortly after dark, just after 18:00. We dumped stuff in our room, then met at 19:00 for dinner. Ale took us to Blue Puppy, a place just off a corner of the main square. 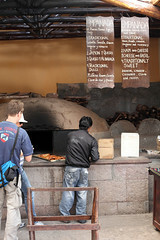 They had a varied menu, with sandwiches, burgers, pizza, pasta, and mains of beef or chicken. M. got a “double falafel vege burger” and I got the chicken breast in huancaina sauce – a Peruvian specialty – with three types mashed potatoes. The burger had about a dozen mini falafels on it and came with hot chips. The huancaina sauce was very nice, nutty and spicy – it reminded me a bit of satay sauce. The mashed potatoes were variously flavoured with chili, basil, and onion and garlic, and were all really good. I had a glass of Peruvian cabernet sauvignon wine, from a bottle that four of us agreed to split: Jian, Laura, Andrew, and me. It was decent. Zaina had expressed a desire for some guacamole before we ordered, and ordered some nachos, figuring they could be shared around. Then once the orders were taken, the waiter brought out complimentary plates of corn ships and guacamole! Zaina ate a lot of it, and then decided to cancel the nachos. Unfortunately the waiter only spoke Spanish and got the request confused, later delivering a plate of nachos with no cheese. Zaina explained the mix-up with Ale, who cleared it up with the waiter. During the dinner, Zaina started to feel a bit nauseous – from all the guacamole I joked, which made her laugh. She and Zeeshan left early, as Lyn had done before the food had arrived, also feeling a bit off-colour. M. and I left before everyone else too, feeling a bit tired and wanting to get an early night in. This entry was posted on Sunday, 5 February, 2012 at 16:45	and is filed under Diary. You can follow any responses to this entry through the RSS 2.0 feed. You can skip to the end and leave a response. Pinging is currently not allowed.